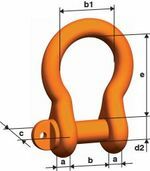 This high-strength, bow shackle with a grade 10 special thread bolt and corresponding markings is ideally suited for all kinds of general lifting processes, without the risk of mix-ups. Both sides of the smooth bolt rest in the eyes and the thread does not protrude into the opening of the shackle. Please check that the bolt is sitting tightly prior to each lifting operation. The shackle cannot be mounted directly into the chain. This pewag product comes with CE-marking and a full operating manual.